The root of the English word rice (which goes back to the 13th century) can be traced to the Latin word oriza, which in turn comes from the Greek word oruza. The Greek word is the source of all European words for rice, be it the German reis, the Polish ryz, or the Dutch rijst. After maize, rice is the grain with the highest production in the world. 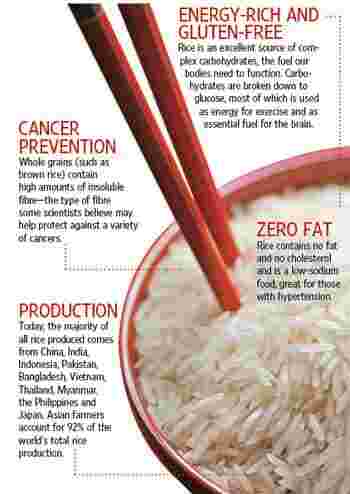 The first evidence of rice being used as food in the sub-continent dates back to around 3000–2500 BC, going by the findings in regions belonging to the Indus Valley Civilization. 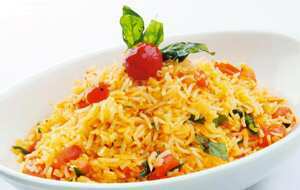 The different varieties of rice go into making different foods: Long-grain rice remains intact after cooking and is popular in Asia in pulaos and biryanis; medium-grain rice becomes more sticky and is popular in sweet dishes, as also the Italian risotto; and its stickier version is used in sushi. Short-grain rice is used for rice pudding. The Arabs use rice as an ingredient in soups and stuffing in vegetables and dishes with fish, poultry and other types of meat. Boil the long-grained rice till done and keep aside. Take oil in a deep pan. Add chilli followed by ginger, tomato, basil and sauté lightly. Add salt and toss the rice well. —Devraj Halder, executive assistant manager—food and beverages , The Suryaa, New Delhi.